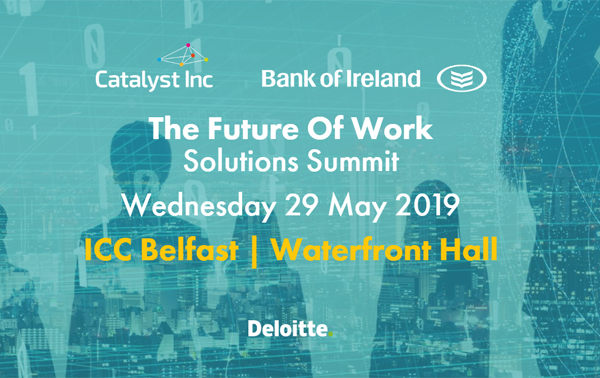 Catalyst Inc is joining with key industry partners to deliver the Future of Work Solutions Summit for business leaders, education leaders and HR directors. Focusing on the areas of Future of Jobs, Growth and Learning, and Leading the Change, the Summit will prepare business leaders to make changes in your business organisations and for educators to prepare people for the workforce of the future. Connect with other business leaders and educators who are passionate about adapting and growing with the changes that come with the Future of Work. Gain invaluable insight from global leaders and researchers who will discuss automation, lifelong learning and how to lead in this rapid time of change. Be inspired by local and international organisations, who have navigated these challenges, grew their business & inspired their people. Hear what educators here in Northern Ireland are doing prepare their students, and how you might adapt this for your institutes. Be challenged to act. Join the breakout sessions where the Summit themes will be explored, inspiring you and giving you tools to take decisive steps in your organisation. Find further information and register your place. You can opt out from receiving our newsletter at any time by selecting the unsubscribe link that is in every email we send. nibusinessinfo.co.uk, a free service offered by Invest Northern Ireland, is the official online channel for business advice and guidance in Northern Ireland.